Midlife brings with it a time where you question a lot of your assumptions. Life changes and the kids move out and you're home alone with your partner and you start wondering why you do a lot of things. Maybe it happens sooner for some people, but for me it was Midlife when it hit me between the eyes. Around the time I turned 50 there were a lot of upheavals in my life - my job sucked, my husband had left his job and returned to full-time study, our kids were gone, and life was pretty dull, colourless and boring. I started to question why I went to work every day when I hated it so much, why I was married when my husband seemed to be fairly distant, what my role was in my kids' lives, and basically what was my purpose? There weren't any easy answers and things looked grim - our marriage came close to imploding, I left my job, and I was in a bit of a dark hole. At the same time my husband was dealing with a dose of depression that made him dis-engaged and fairly intolerant of my slow slide into weepiness and wondering. Things eventually sorted themselves out - as things tend to do when you put in a bit of effort in the right places. But the fallout was that I needed to go on a low dose anti-depressant for a while to help me re-fill the well that had run dry. It's a strange feeling to not be coping when you are normally a resilient person - but it's better to ask for help before you pass the point of knowing you need it. Life has balanced out again - I found a new job quite quickly, my husband found work in his new profession, our first grandbaby was born, married life returned to an even keel - so onward and upward. There are no guarantees in life - it's about choosing to be proactive and making the most of the cards you've been dealt - whinging is not an option! Instead you need to think of it as "Delicious Ambiguity". 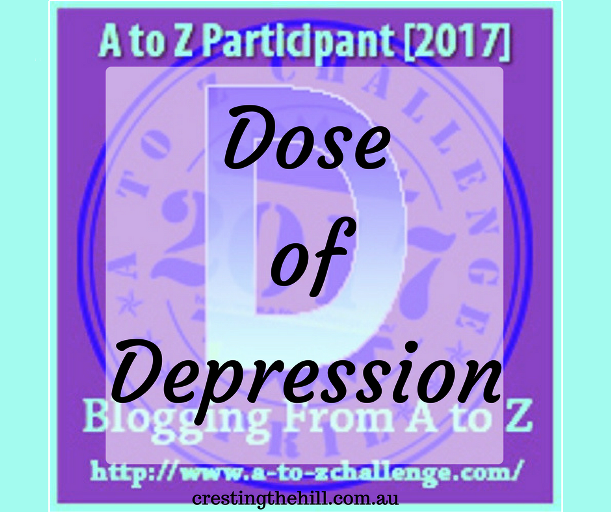 If you'd like to read more about Dealing with Depression you can go HERE or HERE. See you tomorrow for E - which is for the Empty Nest. It's tough when you feel all the cards are falling down simultaneously. That really gets you down. Sometimes the turn around comes when we can just manage to keep atleast one section afloat... That keeps us going on long enough for the rest to slowly stabilize. depression is tough, being able to recognize it is key. 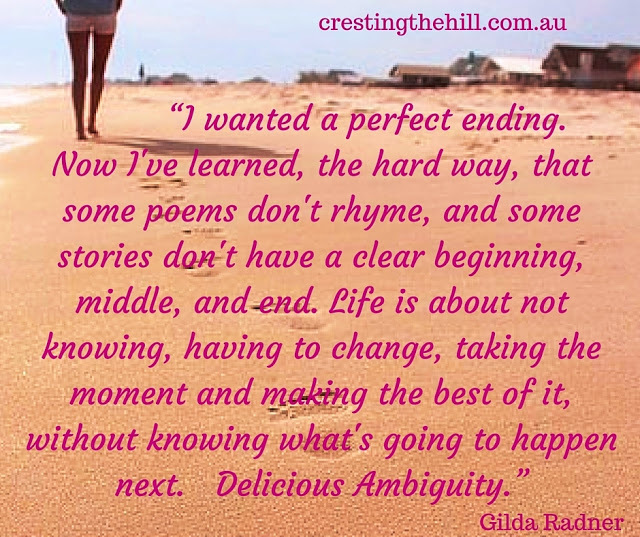 Love the Gilda quote. Good for your for going on the anti-depressant when you needed it. So many people won't even consider it, due to stigma, or not wanting to be perceived - or feel - weak, or whatever. Unfortunately my brain chemistry means I will be on it for the rest of my life. But... it's better than the alternative! Thank you for sharing this open and honest post on such an important topic, Leanne. Oh, and PS: I'm pretty sure your grandchild is the best anti-depressant! Hope you get to see them a lot! I love the quote you have shared at the end of the post; its just so apt and beautiful. Yes things have a way of working out but my god how many upheavals and heart aches one has to endure to get there. I'm sorry to hear about your mid life difficulties but delighted to read how everything worked out and you're feeling better now. Taking medication is wise when you need it and can help you get over that bump in the road. I've had to take it myself. Delicious Ambiguity is a wonderful new term for me. Thanks for introducing me to it. When everything around you starts falling down, and feeling as if we're losing control over life anf ourselves... most difficult times. Glad you sailed through all that. Love the Gilda quote. Glad you got some help early and glad to hear that you came out of it and life is back on track. Depression is a terrible thing to go through. So good that this topic is receiving more open sharing. It takes courage to share our vulnerability with others so they can know they're not alone. I love the Gilda quote also! GREAT post. Right where I am and have been for about a year. I'm coming up on 58 and right where I'm supposed to be. I find this age to be curious, dreadful, fun, depressing, exciting, freeing, ... I could go on and on. I look forward to having time to dig into your archives ... I have a feeling there are treasures there. Thank you! Well done on an interesting and open post. Who hasn't been there at some point? I too had to take an anti-depressant for a while when I argued I wasn't depressed. I just couldn't sleep. Not. At. All. Not good. And yes, I think I'm a stronger person as a result of the time "in the wilderness". Yes to all of that in my 50's and add to that my failing health. It's not all sorted for me, but I began to view my life as an adventure with great hills and valleys. It was unplanned for the first time. While things aren't sorted, I can view them as exciting, sometimes good exciting and sometimes not so much. We too had some trying years, but life is now on an even keel. I credit being open to goodness and an attitude gratitude for seeing us through these times. I can imagine how difficult that time must have been for both you and your husband, Leanna. I'm glad life got better again. It usually does. One my my favourite mantras: "It's only temporary". Your honesty is refreshing, Cheers! I feel that life all of a sudden becomes confusing. I can relate so much to your posts secially this pic (which has your words written) It is indeed hard to 'not think' but it is the correct way to live- cos no future is unknown. oh, gosh, both parts of a couple with depression at the same time must be awful. My guy and I have both suffered from it in the past, but so far (and we've been together for a long time) we were never down in the hole at the same time. I've been having a bit of a rough time myself here on the verge of 50. I'm feeling like the thing I'm hating the most about midlife is that more and more people I care about are passing away. Depression is tough and you never know when it can strike you. Getting help is always a first step in Depression. And I feel self questioning can be really tiring in this situations. I have just started yoga at age 58...it's tough, and it actually doesn't help with my depression at all because i just feel like a conspicuous overweight geriatric amidst the beautiful bodies. I cry during every session. Depression in midlife can be a huge problem Leanne. I think that as the children grow and leave we may realise that we don't have a life. It is a huge adjustment but one we can all overcome. Thanks for shining a light on a subject people are still unwilling to talk about. That final quote you've shared is beautiful! I struggled with depression for about 18 months in 2015-2016. I think I've managed most of it but I'm still mindful I could be vulnerable. Ah, familiar. At several points in my life I found that I have to just stop and take stock. What have I achieved? Where am I going? What do I need? lad things turned out for you. That saying is so cool. Thanks Leanne, Hope is so strengthening.